Technically outdated mechanical components, lack of replacement devices, more stringent safety requirements specified by changed standards: there are a variety of reasons for modernization projects in open-cast mining. Quite naturally, it is the safety aspects that are at the forefront. Large machinery in open-cast mining such as excavators and conveyor bridges are permitted to perform their tasks only within approved design and technologically assured operating ranges. To ensure they adhere to these operating ranges it is imperative to reliably monitor their position in conjunction with a reliable solution to safely limit the end position of moving system components. The dangers posed by large machines such as bucket wheel excavators are immense for personnel and the machine itself: If the boom leaves the allowable range, it is possible that the whole excavator can become unbalanced and topple over because the centre of gravity has moved. To avoid scenarios of that nature operating companies invest in safety solutions such as the U-ONE-SAFETY-Compact offered by Johannes Hubner Giessen; this reliably monitors the defined limit values of speeds and positions. At Johannes Hubner Giessen modernization projects are more than just delivering an encoder system. Here we demonstrate the modernization expertise of the encoder specialist based on an application example (of the bucket wheel excavator mentioned above) — beginning with documenting the present situation on-site to putting forward individual design suggestions through to fabricating and installing the customized encoders and their attachments. For the modernization project of the system, which monitors the bucket wheel excavator, the U-ONE-SAFETY-Compact encoder system was selected to replace the outdated mechanical system. It was installed directly onto the rotary shaft, replacing several individual devices with a single, compact device. The system consists of six position switches, which it is possible to programme according to the desired angular positions. In other words, it is possible to implement the control points as well as the limit switching point with a single device. The compact version of the encoder system U-ONE-SAFETY-Compact consists of a basic unit and directly attached switch or bus modules. All functions are integrated in a robust housing, which is able to defy the harsh conditions in open-cast mining operations. The advantage: it was possible to install the device on-site using the existing cabling. There was no need to install component parts in the electrical cabinet, so there was no need to create additional space. Highly precise safety switching signals are issued according to position and speed based on a 13/15 bit resolution (max. 32,768 rotations). The system-wide two channel architecture facilitates the implementation of safety functions up to Category 3 and Performance Level (PL) d as well as SIL 2. The U-ONE-SAFETY-Compact offers the operator simple configuration options for safe switching points without an additional safety PLC — and, as a consequence, there is no need to intervene in the control software. The on-site situation meant an individual solution was required to install the encoder system; above all, the gear construction was to be circumvented. 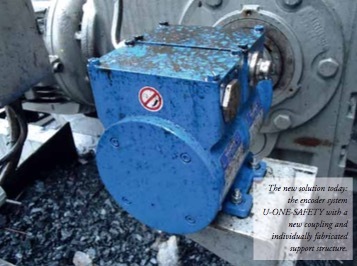 Brandenburger explains:“The new U-ONE-SAFETY is installed using a coupling that is simply slid onto the shaft. In contrast to the chain solution the coupling does not vibrate and there is no play. Moreover, precision adjustment as well as the encoder aligning perfectly with the drive shaft are important factors ensuring both the quality of the signals and a long service life. The solution required a specially adapted support structure, which we also designed and installed on-site.” Throughout the entire planning and execution stages the customer is provided with extensive documentation including sketches, design drawings and an installation report. In addition, a second U-ONE-SAFETY-Compact system was also installed for a further rotary axis to reliably monitor the positions and speeds of the boom as it performs lifting motions. The situation is the same in this case: it is possible to control a variety of limit values with a single device.